Spanish Talmudist of the fifteenth and sixteenth centuries. He was one of the exiles of 1492, and settled at Safed, where he held a discussion with Jacob Berab over a decision concerning meat (Samuel of Modena, Responsa, No. 42). He is mentioned also by Bezaleel Ashkenazi. 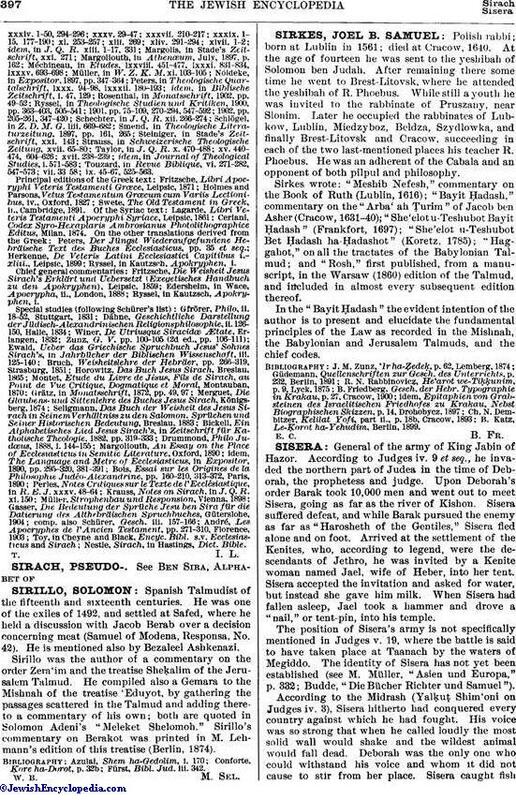 Sirillo was the author of a commentary on the order Zera'im and the treatise Sheḳalim of the Jerusalem Talmud. He compiled also a Gemara to the Mishnah of the treatise 'Eduyot, by gathering the passages scattered in the Talmud and adding there. to a commentary of his own; both are quoted in Solomon Adeni's "Meleket Shelomoh." Sirillo's commentary on Berakot was printed in M. Lehmann's edition of this treatise (Berlin, 1874). Fürst, Bibl. Jud. iii. 342.